Successfully Added Napoli - Unlocked Quadband Dual SIM China Cellphone to your Shopping Cart. Interactive unlocked dual SIM mobile phone featuring everything from, multimedia applications for playing music, videos, watching TV and listening to the radio, to its core communication features such as WiFi, Bluetooth, dual SIM with dual standby and personalized PDA for your day to day tasks and to-do lists. The Napoli combines brawns & brains in one powerful unlocked WiFi mobile phone. 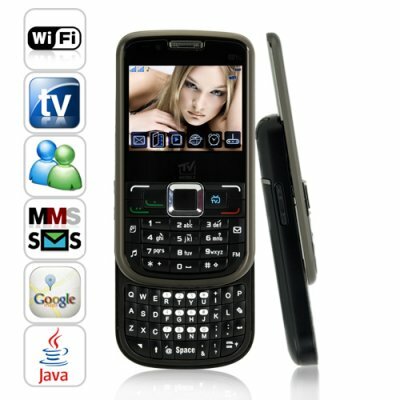 This durably constructed GSM dual SIM cellphone is a slide phone that comes with a QWERTY keyboard as well as a key pad. And with the user friendly interactive menu interface, you'll be able to start operating all the wonderful features this unique cellphone encompasses straight out of the box. This robust and versatile WiFi mobile phone comes with dual front & back cameras, a retractable antenna for FM radio & analog TV, a free 2GB Micro SD card and WiFi accessibility for going online. The Napoli dual SIM mobile phone also comes with MSN, Yahoo messenger and facebook apps, allowing you to chat with friends and accessing your facebook account. All this and more is possible with the Napoli - unlocked dual SIM mobile phone. The Napoli unlocked mobile phone works on the global GSM frequencies of (850 + 900 + 1800 + 1900 MHz). This means, you can use this cellphone anywhere in the world. The dual SIM feature makes keeping in touch with family, friends and colleagues as well as staying entertained a lot easier when going on holidays or business trips, thanks to its dual standby function and onboard multimedia features. The dual standby function allows you to have two separate SIM cards from two separate networks running simultaneously, so there is no need to carry two mobile phones around with you any more. Coming in a beautifully designed body and high tech internal components, the Napoli dual SIM cellphone will certainly make your day with its witty design and looks, and most importantly, its user friendly navigational menu system with awesome audio and video playback. If you're searching for a top of the line mobile phone, but not a fan of touch screen cell phones, then the unlocked Napoli PDA smart phone has it all, WIFI, quad-band GSM, dual-SIM, multimedia mastery, PDA and so much more. The Napoli unlocked Dual SIM cellphone reveals its mastery with its powerful interactive menu system with excellent user friendly navigation, allowing you to browse the Neapolitan mobile phone in-depth features with simplicity. Click "Add to Cart" right away, and in a few days you could be the proud owner of this state of the art WiFi ready dual SIM quad band slide phone! The Napoli is brought to you by the leaders in factory direct China electronics, Chinavasion. When receiving an incoming call, you can mute the call and reply with a text e.g. "I am busy now"
Where can I access the file manager on the Napoli cellphone? The file manager is located within the organizer or this mobile phone. Does the Napoli unlocked dual SIM mobile phone come with an email setup function? No, this unlocked Dual SIM mobile phone does not come with email ready feature. But, you will still be able to go online, and log into your email account.